I was recently invited to attend the “I Can Do It” Conference hosted by the Hay House. It was a wonderful event attended by some of the best authors that Hay House has published. I had the good fortune of being able to meet Caroline Sutherland. Caroline is a medical intuitive who has completed hundreds of reading over the years and she did an intuitive health reading on me which I found to be very accurate. In my interview with Caroline we discuss her new book entitled, “The Body Knows-How to Stay Young”. In our interview together we explore the many reasons that our bodies breakdown and what we can do and how we can arrest the breakdown process. Your entire body is dependent on proper hormone function and we would die within minutes without hormones. Hormones work together in a concert. When one is “off” this will affect all the rest. Balancing is key and with hormones, less is more. Balancing the hormonal system is only one very important key to greater vitality and health. Caroline says that from her medical intuitive perspective, she has found that when a particular decision is made in life, that it must be fully embodied and accepted by the person on all levels or physical symptoms will likely manifest. This is due to the misalignment of the rational mind and the knowing heart. For example, if the decision is made to stay in an unhappy relationship, a dissatisfying job, or to adopt certain lifestyle choice, sexual preference, etc., no matter what the head is saying, the heart and every cell in the body “knows” that it must be in agreement or it is living a lie. Emotions and decisions that are operating at cross-purposes within can play a huge role in illness and chronic symptoms. Do all that you can to examine the depth of emotion that you carry and use this as a tool to strengthen yourself on all levels. 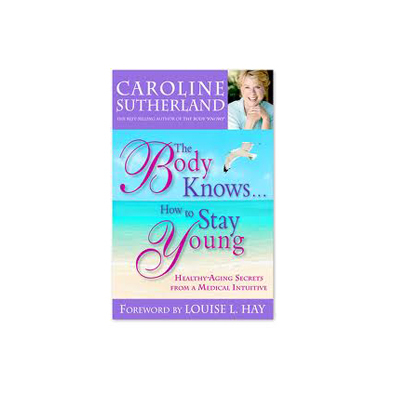 In Caroline’s new book “The Body Knows How to Stay Young” she explores the many facets of staying young and healthy. Her website is loaded with video’s, articles and a products store. If you would like more information on Caroline’s upcoming appearances and how you can benefit from one of her readings, please click here for more information.